SEO Trends: How Will Voice Search Affect SEO? At Blue Compass, we love staying on top of the latest SEO trends, and one we’re keeping an eye on the trends in voice search. Today, we’re seeing three big things happening with voice search: it’s more accurate than ever, more household products are equipped with voice search and the number of voice search queries is rising. In fact, 40% of adults perform a voice search once per day. However, few people type the way they speak, which means websites optimized for the way searchers type may not always match the way searchers speak. As more and more people use voice search to find information online, the way we optimize our websites will shift. As we look ahead at SEO trends, find out what you can do to prepare for the increase in voice searches. Because speaking is often more convenient than typing, people are using voice search on their smartphones, tablets or voice assistants to find information online. Apple users turn to Siri, at home people ask Google Home, Amazon Alexa and Echo devices for quick answers. If you have a PC, you’ve probably used Microsoft Cortana. Whether you’re on a smartphone, in your living room or at a computer, you probably have access to a voice device. In order to optimize your website, it’s helpful to know how search engines are determining search results for voice search queries. Voice controlled devices can primarily give answers to search queries in two ways; they will state the answer to a question, or provide a website where it’s likely you’ll find the answer to a question. 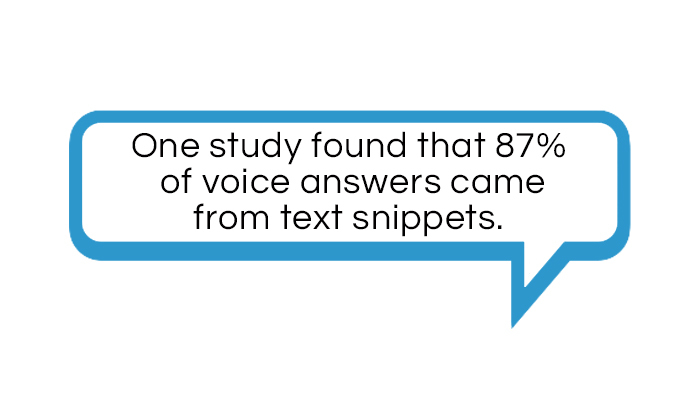 Moz recently completed a study in which they analyzed the search results of 1,000 voice searches and found that voice answers came from featured snippets 87% of the time. Featured snippets are Google search results that appear in a block at the top of search result pages. They provide a summary of an answer which is extracted from a web page. One way to increase traffic from voice searches is to focus on appearing in the featured snippet position for high-value search queries. Google found that 70% of searches via Google Assistant are conversational queries that more closely resemble the way one person would present a question to another person. While text searches have subsequently become more conversational, voice searches are still very different from the way users interact with a text search box. To compete for voice search results, websites will need to focus on writing content in a conversational tone. 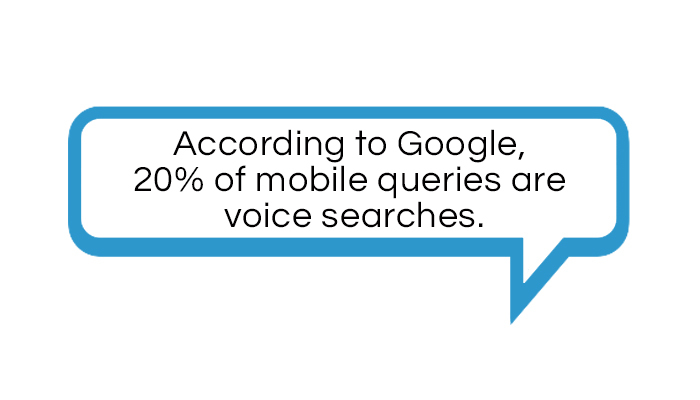 Google has found that 20% of mobile queries are voice searches, and that number will continue to rise. Having a mobile-friendly website will be critical to appear at the top of voice search results. If you’re not optimizing for mobile, not only will it be more difficult to rank at that top spot, but the traffic you’ve worked hard to gain from voice searches may end up leaving your site without converting. Use a responsive design. Today, it’s essential to have a site that responds to devices of all sizes. This ensures that users have a similar experience and see the same site no matter what device they are using. In addition, Google is continuing to place high ranking value on sites that are mobile-friendly. Optimize page load time. Did you know that 40 percent of mobile online shoppers will wait only three seconds before abandoning a site? If you’re experiencing page speed issues, try compressing your images to improve mobile usability. Use 14 point font and buttons in the content. Even though this font size may seem bigger than you need, it makes it easier for users to read your content. Buttons, compared to text links, are easier to click on a touch screen, encouraging visitors to explore the website further. People using voice search are often looking for a store, product or service near them. From a local search perspective, it’s important to use terms on your site which identify your city and neighborhood. The rise of voice search doesn’t mean you need to overhaul your entire SEO strategy or the content on your site, but it does mean you will need to make subtle changes to be more successful in the voice search universe. Here are some extra steps you can take to improve the SEO on your site and prepare for the impact of voice searches. Because many voice search results are coming from featured snippets, using Schema markup on your site is a good starting point for winning the top spot. You should already be utilizing Schema on your site, but if you’re not, this is a great reason to start. Schema markup allows you to add structured data to your site, which helps search engines better understand your content. When done correctly, Schema markup can lead to the generation of rich snippets in search results, which are also prominent on desktop and mobile searches. Spend time researching conversational queries about your products, services and industry. You can use tools like Answer the Public to find questions users are searching about your topic. Research how your industry and your major keywords appear on voice devices. What types of answers are given? Does the device provide an answer, or does it provide search results? You might find that you have a lot of competition, or you might find that your competitors aren’t taking advantage of the voice search opportunities. Voice searches use natural, conversational language, which means long-tail keyword phrases are more important than ever. Brainstorm what naturally spoken questions may be asked about your business, product or service and find ways to incorporate them into your website copy. An effective way to utilize those questions users are searching for is to create a thorough FAQ page. You’ll be able to incorporate the actual questions users are asking their devices into headings, increasing your chance of ranking for the queries. If users search using the common local search phrase “near me,” then your on-site optimization probably won’t impact the results much. Instead, the device will determine the user’s location and pull up listings from online directories like Google My Business and Bing Places for Business. Website managers will want to make sure their business is claimed on these local listing sites and optimized. When setting up or optimizing your Google My Business or Bing Places for business profiles, the first step is to check that your name, address and phone number are accurate in the listings. Don’t forget to check other online directories, too. If you have different addresses on various listing sites, search engines won’t know which address is correct, and it will hurt your chances of appearing in voice search results. The rise of voice search is just one SEO trend to keep an eye on. Following these voice search SEO tips is a great start toward climbing your way to the top of the voice search results. If you have questions about how to create an SEO strategy that covers all of your bases, contact us today!